Hiroshima was the most peaceful city my friends and I visited in our Japan trip despite its history. We mainly walked and took the streetcar to visit all of the city's historical attractions because it was the most convenient and cheapest. You will find an area beside Hondori called Okonomimura where you can find restaurants that make okonomiyaki. It's so delicious! My favorite cafe was Choco Cro because I love the chocolate croissants. Oh, and we did not get the chance to see Itsukushima Shrine because by the time we got to the dock to take a ferry to see it, it was too dark. No one was there so it was a bit shady so we decided to turn around. I suggest you go during the day instead! I did not do any shopping in Hiroshima because I wanted to save my shopping tendencies for the other cities we planned to visit. Hiroshima was our day for historical site seeing. What was convenient was that all the historical attractions of the atomic bombing are located within one area so you are able to see several sites without having to travel far. Hiroshima was a great city to visit for people of all ages and you can see much of the town with one full day. 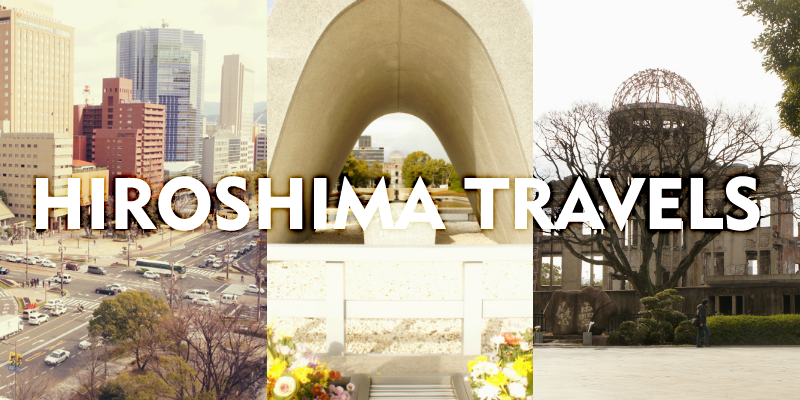 → The city where the historical atomic bomb was dropped. → Reservations can be made through Hotels.com (Get $20 Rebate with 3-Night Booking with the code REBATES14). → Booked a non-smoking, 3 single beds room with a view of the city. The room includes bathtub, toilet, air conditioning, television, direct-dial phone, and hair dryer. → Wifi, bar/lounge, and coffee/tea are available in the lobby. → Microwave is available upon request. → Peaceful and quiet hotel that is a couple blocks away from the tram (walking distance). The room is small and a cot may be added for an additional person. Most of their appliances and furniture are old and outdated. However, their location is ideal because it is located near restaurants, convenience stores, and the main attractions. → Train: Before you travel to Japan, you can buy a JR Rail Pass at JRPass.com (available for purchase for $279 in the US, not available to Japanese residents) that will be shipped to your home via FedEx. This may save you a lot of money if you plan to travel via train several times in Japan (can also be used in the subway for JR lines). At the airport, there is a JR Pass service area where you show them your pass you received in the mail and they will give you the actual official pass that is stamped for you to use whenever you ride the train. The option I chose was a 7-consecutive day pass with unlimited usage within the 7 days, beginning the first day you use it in order to travel from city to city in Japan. Prior to boarding a train, seat reservation is available but not required. Just show your official pass at the gate and then you are free to board a train. Destinations and train times are listed on the monitors above you in the station, but be aware that there are faster and slower trains. The JR Rail Pass can also cover your subway transportation if you are using a JR Line; just ask at the gate. If you are ever lost, just ask an attendant as most are very helpful even with little English. → Electric Railway/Streetcar: Many people travel by streetcar in Hiroshima. They are located in the middle of the street and usually arrive every 5-10 minutes. Fares vary by where you board and exit. The fare costs between ¥110-¥260 and payment is due when you get off. Child far is half the amount of an adult fare. → Hiroshima's most famous food is their okonomiyaki (crepe topped with bean sprouts, egg, pork/prawns/squid, soba/udon noodles, shredded cabbage, fried flakes, and their special sauce) served on an iron grill. → Hiroshima Peace Memorial Park: A memorial park dedicated to the victims who were killed by the nuclear bomb attack. Within the park, you can see the Flame of Peace, Memorial Cenotaph, A-Bomb Dome, and the Hiroshima Peace Memorial Museum. → Children's Peace Monument: A monument of thousands of paper cranes in memory of the children who were victims of Hiroshima. → Hiroshima Castle: The home of a feudal lord which was destroyed by the atomic bomb but then reconstructed. → Itsukushima Shrine: A standing shrine on an island called Miyajima in the middle of the ocean that appears to be floating on the water. The view of the city from the room in Hotel Sunroute. There is also a river not pictured on the left. The streets are very organized an clean. Just walking around trying to figure out where to go. Found a restaurant selling okonomiyaki! My mouth was watering as I watched the lady make it. Walked around the block and found ourselves in Downtown Hiroshima. Hondori Street is filled with little shops. Passed by a shopping area but did not go inside. The beautiful Aioi River beside the dome. The view of the city. We were lucky it was such a nice day. The Memorial Cenotaph in memory of all those who were killed by the bombing. It is aligned with the Peace Flame and the A-Bomb Dome. The reconstructed gate of the ninomaru. We wanted to see the Hiroshima Castle but everything was closing for the day. One of the few trees that survived the bombing. Last photo of the day inside the gates.